If you walk down Edward St towards the Brisbane River you will come to a building that we have looked at previously - the Port Office Hotel, named after the old Port Office building (now the Stamford Plaza Hotel) situated on the other side of the street near the northern entrance to the Botanical Gardens. 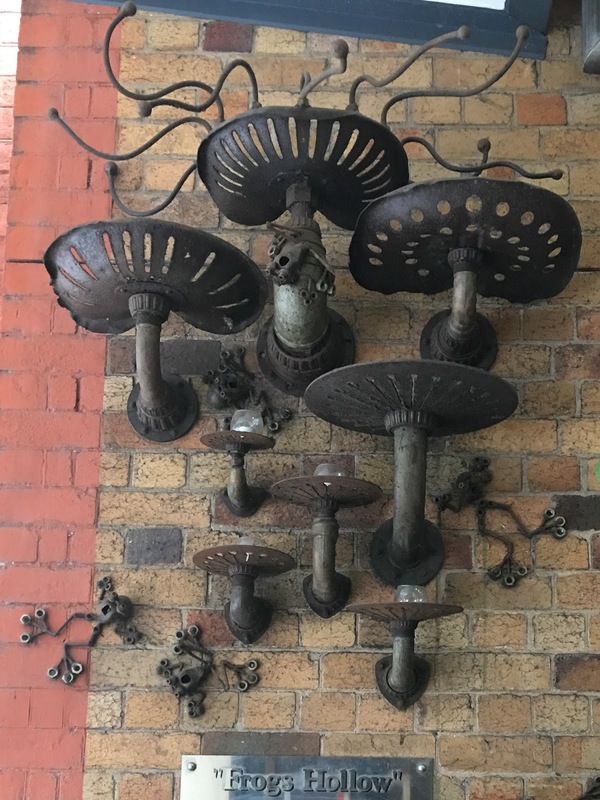 On the Edward St wall of the Port Office Hotel is the sculpture named "Frogs Hollow" shown in the photograph below. The piece was created by Christopher Trotter as part of his "Nature" series, several of which are dotted around the CBD, and it is a physical representation of the name that was given to this area in days gone by. If you look at the work you can pick out the frogs, toadstools and reeds that used to be present in this low-lying part of Brisbane. Frogs Hollow was a marshy and unpleasant area bounded by Edward, Alice, Albert and Charlotte Streets that became waterlogged when it rained. In really heavy rain, the area used to become flood-bound, as can be seen in the following image taken during the 1864 floods, looking down Charlotte St from George St towards Edward St.
"rare clustering of drunkards, prostitutes, larrikins, thieves and assailants who, in one way or other, lived off the visitors, mariners, and new arrivals at the many boarding-houses, lodgings and hotels"
One estimate in the late 1880's indicated that as many as 50 percent of cases that came before the Police Court originated in Frogs Hollow. The cheaper dwellings and the moist conditions also attracted another group - the Chinese. Some were market gardeners but many more were involved in illegal gambling and drugs. Sometimes attempts were made to close down the illegal establishments and on occasions this resulted in full-scale riots. Gradually though, Brisbane expanded and Frogs Hollow was drained and cleaned up as businesses moved there. The construction of buildings such as Watson Bros and HB Sales brought people to the area, gradually forcing out the opium dens and brothels. A wealth of information as usual! This is good trivia to impress my mates with. I thought that you may have photographed/blogged about this some time ago Cara? I think the photo is from the 1864 flood, not 94. Yes, you are correct. The State Library file does say 1864. I have amended the text - thank you for the input. Love reading your snippets of Brisbane's history. Love the sculpture and must check it out next time I'm in Edward St.